These three belt buckles come from the Chinese communities of Malaysia. 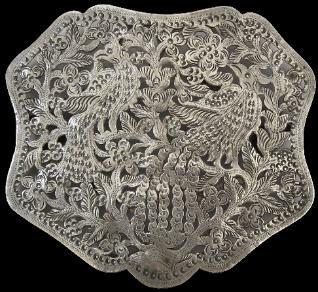 Buckles such as these seem to have been used by the Straits Chinese communities of Pennag, Malaca and Singapore although they are not typical. 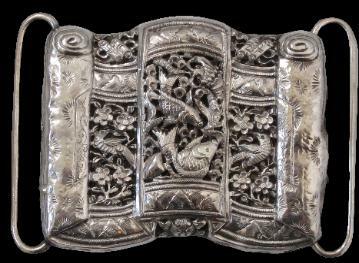 The two scroll-like buckles are more typical of the work of Chinese silversmiths in Sarawak and were worn by local Chinese as well as local Iban and other people. These two are decorated with dragons, humming birds, prunus blossoms, carp and other typically Chinese motifs amid open-work. The larger of the three is engraved with a pair of phoenixes amid foliage and against an open-work background. It is of a type normally referred to as ‘Aceh’ style. None of the three buckles is marked with shop or silver marks. The buckle on the far left above has a replaced keeper. 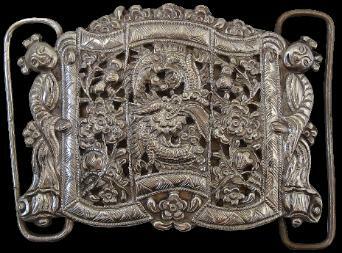 similar buckles are illustrated in Ho Wing Meng, Straits Chinese Silver: A Collector’s Guide, Times Books International, 1984, p. 95.